Prime Minister Sheikh Hasina on Saturday hoped that the future leadership would come from within the students. “We have been looking for new leadership and it should come out from among the students. That is why, school cabinet has been introduced,” she said. The premier was speaking at ceremony at Ganabhaban where the newly elected Dhaka University Central Students’ Union came on her invitation. Hasina, also the president of the ruling Awami League, said congenial atmosphere had been prevailing in college and university campuses for practicing democratic values. “A healthy atmosphere for politics has been prevailing on the campuses, which was absent in the past. Elections to Dhaka University Central Students’ Union have been organized to build new leadership,” she said. The premier advised them to work together for the welfare of the DUCSU and the students. “Do not need to think of who could cast vote or not. It is the duty of those who have been elected to look into the welfare of the university,” she said. DUCSU vice president Nurul Haque Nur and Bangladesh Chhatra League president Rezwanul Haque Chowdhury, newly elected DUCSU general secretary and BCL general secretary Golam Rabbani and AGS Saddam Hossain were on the stage with the premier. Other office bearers were also present at the programme. Asking the DUCSU leaders to discharge responsibilities properly, the premier advised them to remain alert against the fortune seekers. The premier bitterly criticized the attack on the resident of the DU vice chancellor during an anti-quota movement of government services. “Vandalizing the house of the vice chancellor is no way acceptable,” she said. Portraying the unrest at the female halls during the anti-quota movement, the premier recalled her sleepless night thinking of the security to the female students. “When I heard that the female students went to the hall safely, then I went for the rest,” she recalled. 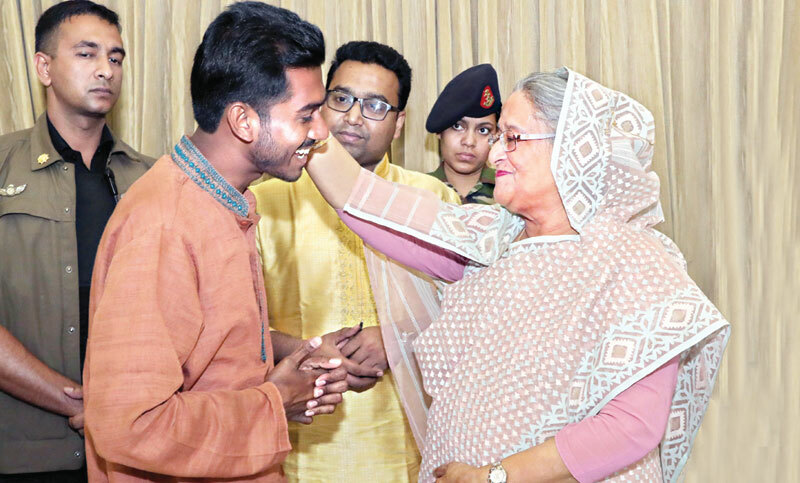 Addressing the DUCSU VP Nur said that he found her mother in Prime Minister Sheikh Hasina. “I lost my mother at the age of two and half years. I found my mother in my school teacher. And now I found it in Prime Minister,” he said. The DUCSU VP sought the premier’s support to make the organization an effective one.